All over the country women are racing for life to raise money for cancer research. Last Saturday's race was on Hampstead Health. Congratulations to these women who ran a great race. 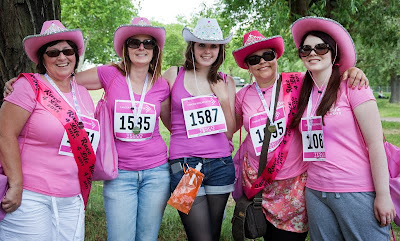 Find out how you can support on the race for life website. You can also support the cause through one of our City Daily Photo Bloggers (CDP), Ham of London. You can read his story here. It's a good way to raise awareness and funds. My daughter and her two daughters are taking part in a race in Dorset. Pink to make the boys wink! Go girls! Best race in town...in so many cities throughout the globe. Kudos for all the participants!! It is remarkable how these races have become popular around the globe. Congratulations to these beautiful women. Fantastic cause and great story Mo. Lovely! Did you take part yourself Mo?